Financial-001 The sample is shown on a 1.5" x 3" badge. The The font used in this sample are: line 1 and 2 Arial Rounded Bold and line 3 is Arial Narrow in the deep navy blue color. If you wish to have your badge with these fonts, just note in the comments area "please use the same fonts as in your sample". The image works well on any of our rectangular badges. Pillar-001 A pillar, symbolizing wisdom and strength on a faux stone background. The sample shown is on our 2" x 3" badge size using the ZapfEllipt font in medium gray for the company and a light gray with a medium gray outline for the name. 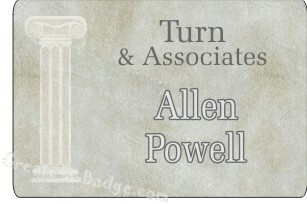 This image works best on our larger rectangular badges.